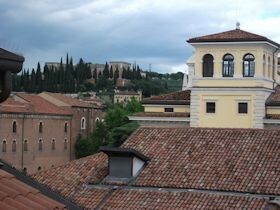 In Verona, we were staying at the Hotel Accademia www.hotelaccademiaverona.it right in the heart of the city so most of the main attractions were in walking distance. On arrival we were offered a welcome drink in the elegant bar decorated with old photographs from silent movies. The bar was well supplied with free snacks we could eat such as crisps and olives. 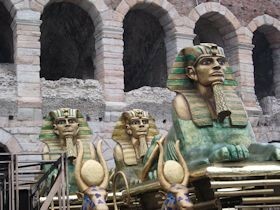 The focal point of Verona is the Arena, which can accommodate 20,000 spectators who come here to watch opera in July and August, although other productions are staged throughout the year. We saw scenery and props piled up outside the arena. As we were so centrally located it wasn’t long before we found Aquila Nera Café www.aquilaneraverona.com offering a self service buffet everyday from 12 noon to 3pm at 15 euros a head. As regular readers know I am a fan of buffets because you can see exactly what you’re getting. Fortunately a helpful woman stood by the buffet so after Ray explained his allergies, she pointed to the dishes he could eat; she did the same for me. 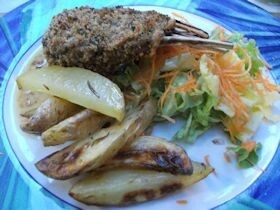 We ended up with a delicious array of meat dishes and freshly cooked vegetables as well as salad. For dessert I was able to eat crème caramel and fresh slices of orange, but there was nothing Ray could eat (he can’t eat oranges). So he looked the other way as I indulged in my crème caramel something I hadn’t eaten for years. 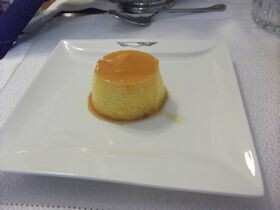 I wonder if you can make an egg and dairy free crème caramel? You may think 15 euros is expensive for a buffet meal. 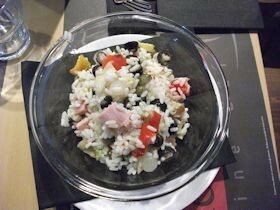 It is, but I was quoted 15 euros for a salad in Piazza d’Erba, Verona. Italy is expensive for dining out. After Ray’s blue plaque moment in Venice, we were prepared to go without an evening meal as we didn’t want Ray to be ill again as we felt we were in a “Russian roulette” situation. We wandered around the Arena and started to explore the back streets away from the main drag to see if we could find a suitable quiet restaurant. We looked at several but there was always something dubious about them. For example, one menu described a horsemeat dish with donkey sauce! Eventually we came across a small restaurant Osteria Casa Vino, Vic Morette 8/a, tel: 045/8004337 http://www.osteriacasavino.it/ off the beaten track with tables outside. A large group of Americans were being served and we could hear a woman speaking English to them. Ray took this as a good sign and we sat down. This woman called Janina listened intently to our list of allergies and made suggestions. 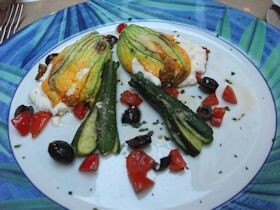 As a starter Ray ordered smoked salmon (9 euros) and I had Fiori Di Zucchini (zucchini stuffed with ricotta cheese). This was followed by lamb in breadcrumbs (17.50 euros) for Ray and grilled turbot (16 euros) for me, both accompanied by grilled vegetables. 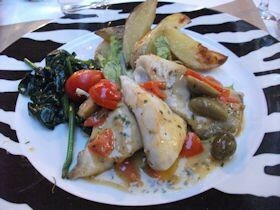 It was delicious and the ambience of the restaurant was delightful with friendly staff. 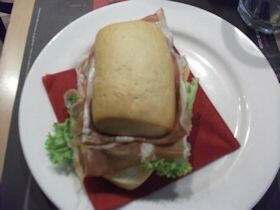 One of our fellow diners was an American student staying in Verona who was dairy free. She, too, had been having problems although she’d found some pizzerias where they had tailor-made pizzas for her, omitting the cheese “but in some cases I’ve just had to have a salad,” she added. We took the precaution to wait 40 minutes after we’d eaten our meal having a mint tea to check if Ray was ok. He was. 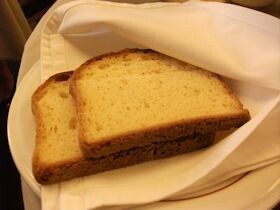 When we’d asked our hotel whether they could order in soya milk and gluten free bread, we were told they already supplied it and to our delight, it was true. 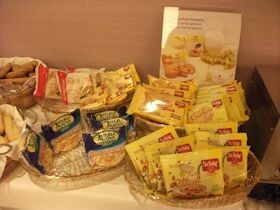 The breakfast buffet was extensive with plenty of items we could eat. On the cold side, there was tuna, olives, tomatoes, ham. 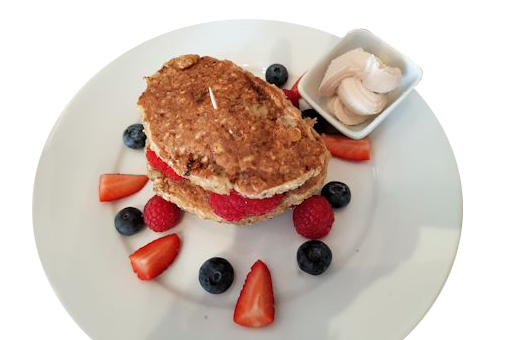 Usefully the cold meat section was labelled gluten free and dairy free so we knew which were ok.
A section of the buffet was dedicated to gluten free and dairy free items including muesli, crispbreads, biscuits and a dairy free croissant with apricot jam in the middle. My toasted gluten free bread arrived and I was able to choose from the selection of jams – I chose blackcurrant. Ray suggested I should put a thin layer of mayonnaise on first followed by the jam as this gives the taste of buttered toast – absolutely scrumptious. I finished off with a platter of fruit including fresh pineapple, melon, apples and prunes. 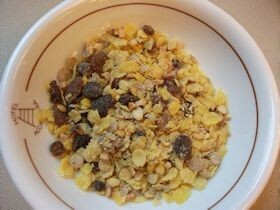 So we both had substantial breakfasts. We wandered into Piazza D’Erba the main square. 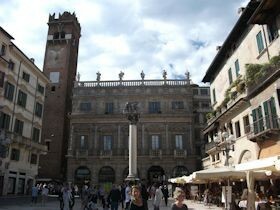 In the middle is the spectacular statue of the winged lion of St Mark C XVI century and the fountain of Madonna di Verona 1368. It is an elegant square and on a Sunday you can sit and gaze at the architecture. 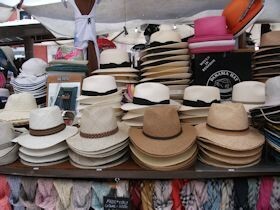 On other days there’s a market selling all manner of goods such as hats, scarves, food and general paraphernalia. 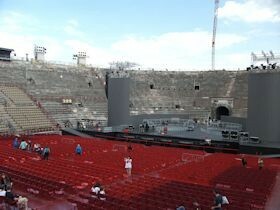 We paid to enter the Arena which was smallish when compared to other arenas we’ve visited such as Rome’s Colosseum. 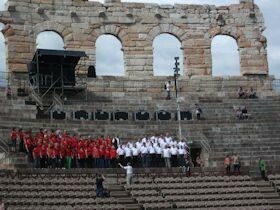 A highlight was the impromptu performance by a German choir a capella inside the Arena – MGV Langenbruchen from Heidelberg with women wearing red tops and the men in white – very impressive. We were so appalled at the cost of meals and concerned about Ray’s health, we bought “picnic” items at the nearest supermarket – Pam Panorama, Via Dei Mutilati 3, Verona – and ate them alfresco. We did this successfully one evening and one lunchtime. Not only did we save money but we didn’t have to worry about what was safe to eat in some unknown restaurant. We also visited Juliet’s House, where tourists write their names on the walls. Ray thought this was a rip off when we paid to go inside. I could see he had a point as the house just contains items relating to Juliet. There isn’t much to see at all – just have a look at the famous balcony outside. That’s all you need. One of the best cups of tea we had in Verona was at the Loacker shop www.loacker-moccaria.com with giant T-bags in good sized cups, although costly at 3.20 euros a cup so make the most of every sip! It also houses a shop selling chocolates and biscuits. As for Venice, we had to pay a city tax of 12 euros. Ray explained his allergies and was given a prosciutto baguette with lettuce (but crucially no butter) and I enjoyed a rice salad.